How do you improve your ping pong skills to become more competitive? Practice is key, of course, but practicing with inferior equipment will only take you so far. The materials, the weight, and the rigidity of the paddle you’re using all play in part in giving you speed, control, and spin. Practicing with a paddle that doesn’t lend toward your play style can hurt your game or make you adjust to practicing wrong techniques. You need the best ping pong paddle for spin if you really want to improve your game. Here are our top picks for different play styles and experience. How much you enjoy the ping pong game primarily depends on the type of paddle you choose to play with. There are several aspects of a ping pong paddle that you need to consider before deciding which one suits you best. The first thing you should consider before choosing a paddle is what level of player you are. Are you a beginner, an intermediate, or an expert player? If you are a beginner, having a paddle that is lighter and slower is the best way to learn more about ping pong, as it will allow you to place the ball back to the table more often, until you have completely understood the advanced techniques of the game. Once you become more of an advanced player, you can opt for highly rated paddles because at that point, you are probably playing with a partner for competition and you need to win. An advanced player has more factors to consider when buying a paddle (compared to a beginner). Secondly, the type of surface that suits your level of expertise in ping pong matters. Ping pong paddles are covered in rubber. Some have thinner sheets of rubber, and other thicker. If you are looking to have more control over your ball and added traction while you play, choose a paddle with a thin rubber surface. Surfaces with thicker rubber have a good grip, a lot of spin, and the ball moves at high speed. We don’t recommend them for beginners. In addition to the above factors, it is important to consider the texture of the paddle that you want to use. Paddles have textures that resemble “dimples.” The texture increases speed and increases traction while playing. Deep textures produce with few spins, so you’ll want shallow dimples on your paddle if you’re looking to add more spin. Additionally, consider the amount of sponge of the paddle. The amount of sponge determines the weight of a paddle. For a beginner, a light paddle is a perfect fit. A light paddle gives less speed and therefore slows things down, allowing you to have proper control. It also provides sensitivity, giving you proper focus on how the game is played, ensuring that you are aware of how long the ball takes before you can hit it again. Having a heavy paddle, which is denser, will help you hit the ball with more speed, and it is, therefore, a great choice for an expert player. With the above factors in mind, here are our recommendations for options that will give you the most spin as an expert and as a beginner player. The Killerspin JET 800 Speed Paddle is the most preferred table tennis paddle for an advanced player. The design of this paddle is stylish, and the great look makes it even more inviting. The paddle is made of carbon fiber, plywood, rubber, and a solid wood handle. The wooden side tape on the paddle prevents damage and aids greatly in preserving the energy generated from the ball, which makes your shots more powerful. The handle on this paddle ensures that no matter the size of the hand holding it, it does not slip off. The JET 800 has two layers of carbon fiber sandwiched between five layers of plywood material. The carbon layers aid greatly in enhancing an aggressive playstyle. This comes in handy if you’re an offensive player. You’ll enjoy how the carbon fiber adds an extra pop when you hit the ball. The carbon fibers also play the role of absorbing hard slams coming from the opponent, allowing you to have more stable and accurate returns. When you want to hit the ball hard, the carbon fibers help in increasing the speed of the ball. The 5 layers of premium plywood are very flexible, making the paddle moderately heavy, but also quite flexible. They help in improving the firmness of the paddle. The layers absorb energy from the table tennis ball, helping regulate the speed of the ball and reducing its impact, and thus helping you make stable returns. The 2mm rubber covers the surface of the paddle. It is ITTF approved, and it has high tension, increasing the spin and power of the ping pong ball. The rubber of the JET 800 paddle has good grip, which helps minimize the speed of the ball strikes, giving you a way to counter the shots of your partner accurately. Based on the above description, the Killerspin paddle is a high-quality, durable, well-designed paddle for spin. Its features make it more expensive than other rackets, but because you won’t have to keep replacing them, the paddle is definitely worth the money. You can purchase the Killerspin JET 800. It comes with a memory book case where you can keep your paddle and a record of your wins along with any notes for improvement. Killerspin backs it with a 30-day warranty, so go ahead and put it to the test. This STIGA Evolution is best known for having the best control, making it the best choice for a beginner. It is a unique product with a technology that converts energy absorbed when the ball comes into contact with the paddle into sound energy. This process, which happens inside the paddle, through a high-tech rod inserted inside the handle and blade, aids in increasing the speed of the ball. It also enhances the control you have over the ball, meaning that you can hit the ball in whatever direction you prefer. That means that it will improve your accuracy in the game. The STIGA evolution is made of six layers of plywood. The hollow handle makes it much lighter, and this is why it is perfect for you if you want to improve the technique of your stroke. The premium rubber used to make the surface has a thickness of 2 mm, and it is ITTF approved. The STIGA Evolution racket is perfect for you if you prefer playing closer to the table, and although it is not the perfect racket, with all these characteristics, it is certainly worth the money. If you are a beginner or an advanced beginner, the Palio Expert 2 is a good choice for you because it has the unique quality of maintaining a balance between speed and control. This paddle is made of a softer sponge and a sticky rubber surface, which helps produce more spin while increasing your level of control for the ball. The rubber is of high quality, specifically CJ8000, and is ITTF approved, giving you full confidence in the product. The wooden blade of it is designed to help improve its overall quality, making it more efficient and durable. Fitted with a flared handle, the paddle is comfortable, thus providing increased accuracy while you play ping pong. Another unique characteristic is that you can buy the rubber separately from the blade and handle. This is an advantage, as it allows you to replace the rubber after it wears out. It comes with a carrying case, unlike most of the other products. The case ensures that the rubber is kept clean and free from dust and dirt when you’re not using it, helping it last longer. Because the Palio Expert 2 is mostly for beginners, it has a moderate price that is affordable for everyone. The Butterfly Balsa Carbo racket is one of the most efficient paddles designed for players with the most experience in playing ping pong. It is a high-performance racket with increased speed, and it provides a massive number of spins. Due to the high speed, you might take longer in getting used to this paddle, especially if you normally wield moderate speed rackets. This Butterfly paddle is made from high-quality materials. The rubber is from Tenergy FX. This makes it the most costly paddle currently on the market. The rubber used to make it gives it a soft feel, making the ball movement precise and consistent. It has five layers of material: three plywood and two carbon. The carbon layers make the blade lightweight and powerful at the same time. A powerful blade increases the speed at which the ball moves. The distance category of the Butterfly blade is middle to far distance, making it the most powerful paddle. If the cost wasn’t as high it is, you’d certainly see more players using this model. The high-quality materials and the performance of this racket, however, completely justify the higher price if you have the budget for it. Unlike other paddles, the Butterfly Balsa Carbo is custom made, meaning that comes fully assembled when you purchase it. This saves you the trouble of having to glue the paddle parts together to play. You can also order it with a flared handle, straight handle, or anatomic handle. If you are an advanced player looking to improve your speed, then go for the STIGA Pro Carbon table tennis racket, which has the highest speed of all the ping pong paddles. It is the ultimate combination of speed and power in one racket. All of the parts are specifically designed to improve your speed and general performance during a game. The STIGA Pro Carbon paddle has five layers of balsa wood located at the center of it. The wood is ultra-light, which highly increases the speed of the ball when you hit it with this paddle. The two carbon layers make the paddle more rigid, thus improving your response. The paddle also has a 2mm sponge. It is neither too thick nor too thin. This means that the optimum size of the sponge makes the paddle light and less dense. But though this is meant to give you control over the ball, this is not the case due to the high speed of the paddle. This is the disadvantage of it: to get so much power, you have to forego a little control. Getting used to the increased speed is also another setback as it will take some time even for an advanced player. The S5 rubber forming the surface of the STIGA Pro Carbon paddle is ITTF approved, and because it is neither too soft nor too tight, it gives the ball consistent movement and generates more spin than any other paddle in the market. 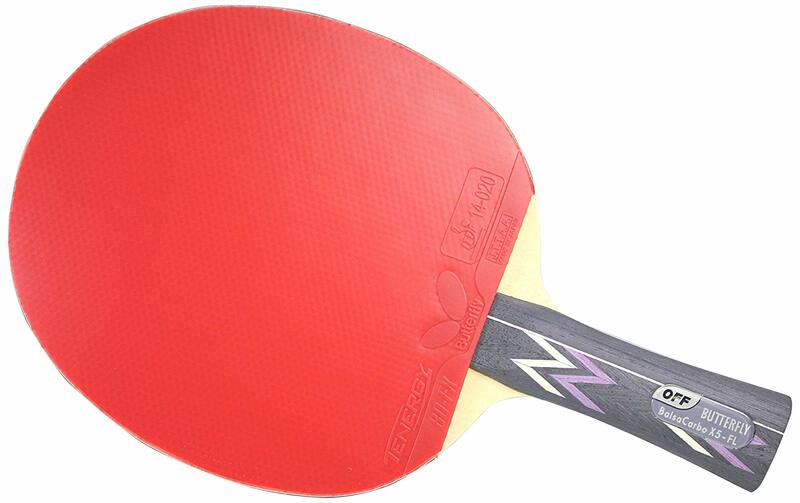 The high-performance ratios of the paddle are due to the high quality of the rubber. Don’t be worried if the rubber on your racket is slowly wearing out because you can replace the rubber whenever you want to. After reviewing the best paddles in the market, it is evident that none of them beats the Killerspin JET 800 Speed as the best ping pong paddle for spin. This paddle also has the most advanced and stylish features, making it the best package overall. The wooden side tape is only available in the Killerspin paddle, which makes it very durable compared to all the rest. The burnt wood handle is also very attractive for its protection properties that make the paddle even more long-lasting. It saves you money to buy a long-lasting, high-quality product once instead of constantly spending money to replace a low-quality product. The nice thing is that the price for the paddle isn’t very high to begin with. With the Killerspin paddle, you’ll get a high-performance, highly durable racket that you can use competitively for the longest time. 9 Best Shuffleboard Table Reviews – Long Game, Lots of Fun!